Fishing has never been so fun. 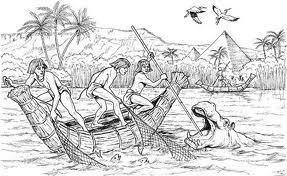 Attach a sharp bronze hook to a length of string, put some meat on the hook and throw the string into the nile. Wait for a fish to bite and then pull the string up. You can also use nets and spears. Nets are easier to use but with practice spears are great too.